Our Hahnemühle Photo Rag® material is a white, 100% cotton paper with a matte smooth surface texture which meets the highest archival standards. With its premium matte inkjet coating, Photo Rag® meets the highest industry standard regarding density, color gamut, color graduation and image sharpness, while preserving the special touch and feel of genuine art paper. A heavy weight paper of 308GSM (Bond weight 82#, 48mm) is the perfect paper for museum and home exhibition, limited edition reproductions, and portfolio work where the absolute highest aesthetic and professional presentation is desired. This product is offered with a choice if straight cut, or rough “deckled edge” depending on your mounting or framing needs. Genuine Art Paper with premium matte inkjet coating. 100% Cotton Rag heavy weight paper rated at 308GSM. Photo Rag is a white, 100% cotton paper with a smooth surface texture that guarantees archival standards. With its premium matte inkjet coating Photo Rag® meets the highest industry standards regarding density, color gamut, color graduation and image sharpness while preserving the special touch and feel of genuine art paper. Heavyweight paper of 308GSM (Bond weight 82#, 48mm). *Based on accelerated testing of prints on specialty media, displayed indoors, under glass. Actual print stability will vary according to image, display conditions, light intensity, humidity, and atmospheric conditions. myphotopipe does not guarantee longevity of prints. 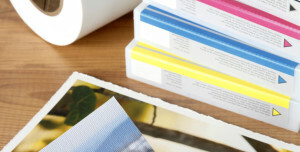 What paper is used for your Fine Art Prints? 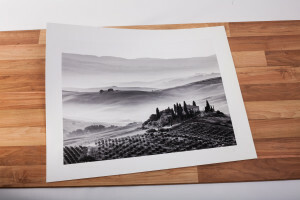 Our Fine Art Prints are made with 100% Cotton Rag Hahnemuhle. It’s a heavy weight paper of 308GSM (Bond weight 82#, 48mm). It’s similar to water color paper but smoother and without the tooth or texture. How are Fine Art prints made? Fine Art prints are printed using the highest quality archival inkjet process. Why do the Fine Art prints take so much longer than the Photographic prints? 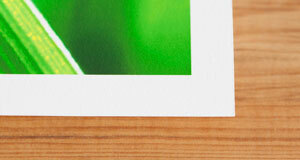 The Fine Art prints are an inkjet process. In order to provide a quality product, we print and then let the inks dry overnight. Then we must use a protective spray to protect the surface which must dry overnight.